Centre de traitement du virus Ebola à l'hôpital de Beni, au Nord-Kivu, en République démocratique du Congo. The World Health Organization (WHO) says the deadly Ebola virus is likely to spread in the eastern Democratic Republic of Congo because of deteriorating security in conflict-ridden North Kivu and Ituri provinces. The latest WHO figures put the number of Ebola cases at 885, including 555 deaths. International efforts to stop the spread of the deadly Ebola virus in eastern DR Congo have hit a serious roadblock. The charity Doctors Without Borders has suspended its life-saving operations. The action follows attacks on two of its Ebola treatment centers this week — the first on February 24 in Katwa, followed by an attack three days later in Butembo. The World Health Organization called the attacks deplorable and said there is a great risk of the spread of the disease. 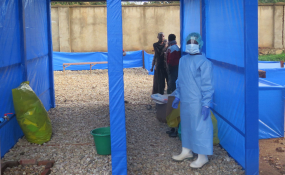 During the attack on the facility in Butembo, four Ebola patients fled for their lives. WHO spokesman Christian Lindmeier said three of the patients have since returned, while one is still missing. "If you want, the positive note is that all of these four patients were convalescent, that means they were already getting better," he said. "Hence, they had a lower viral load, which makes it way less likely for further infections.But yes, it is highly important to find those people, that last patient and then, of course, immediately start the contact tracing and monitor the contacts these patients might have been in touch with." Lindmeier said the WHO remains committed to staying in the DRC until the job is done. However, he notes that an Ebola outbreak as complex as this one can only be managed collectively and by having all the partners on the ground. He added that it is normal to expect organizations to do whatever is necessary to protect their staffs. The Ebola outbreak in North Kivu and Ituri provinces is the second largest in history after the 2014 epidemic in West Africa that killed more than 11,000 people.Prior to the recent incidents, progress was being made in containing the spread of the Ebola virus in the DRC. The WHO reports the disease is now largely under control in the former hot spots of Mangina, Beni, and Komanda.It says more than 250 people have been cured and 80,000 protected through vaccination.